A dexter hand holding a sheaf of arrows, all Proper. This most ancient family takes its name from the lands of Brodie near Forres in Morayshire. The family lost most of its early charters and other documents when the Gordons burnt the castle in 1645. Shaw suggests that the name itself is derived From the Gaelic word, “brothaig”, meaning ditch. 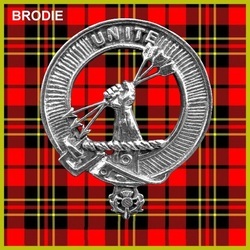 He suggests that they may have shared S common ancestry with the Morays and Inneses who were all settled along the Moray Firth in the twelfth century, pointing to the similarity of their coats of arms, each of which bears three stars.Michael Brodie of Brodie received a charter of confirmation of his lands of Brodie from Robert the Bruce. The charter declares that Brodie held the thanage of Brodie by right of succession from his paternal ancestors. It has been suggested that the family may even have Pictish origins, being descended from the royal Family who carried the name, “Brude”. There is much evidence of Pictish settlement around Brodie, and although there is no certain proof of the claim, it must be considered as at least a reasonable explanation.The Brodies were certainly prominent among the local nobility, and the name appears throughout the fifteenth and sixteenth centuries in charters of the diocese of Moray. John “de Brothier “. is recorded in a church charter attending on the Earl of Mar, Lieutenant of the North, in 1376. Thomas de Brothie, and his sons John and Alexander, are mentioned in connection with the Vicarage of Dyke, a living eventually bestowed on Alexander. Alexander Brodie of Brodie appears to have been a local judge as he was summoned before the Lords of Council in Edinburgh in January 1484 to give account of one of his verdicts. John of Brodie is mentioned many times as an arbiter of disputes particularly in 1492. He may be the same John of Brodie who assisted the Mac Kenzies in their battle against the Mac Donalds at Blair-na-park in 1466. He witnessed a contract between the Calders and the Baron of Kilravock in 1482. His great-grandson, Alexander Brodie of Brodie, was denounced as a rebel, along with 126 others, in 1550 for attacking Alexander Gumming of Altyre and mutilating one of his servants. The rebel’s eldest son David had his lands of Brodie erected into a free barony under charter of the Great Seal in July 1597. He had several sons; the second, Alexander, purchased the lands of Lethen and is ancestor to the Brodies of Lethen. The eldest son, another David, inherited the estates in 1626, but he died only six years later when they passed to his son Alexander, later the judge, Lord Brodie. Alexander Brodie of Brodie, who was born in 1617, was a vigorous supporter of the reformed religion, and in 1640 he attacked Elgin Cathedral and destroyed its carvings and paintings, which he considered idolatrous. He represented Elgin in Parliament, and in 1649 was one of the commissioners sent to negotiate with the exiled Charles II his conditions for his return to Scotland. He was an able politician, as after the defeat of the royalist forces at the Battle of Worcester in 1651 he was summoned to London by Oliver Cromwell to consider a union between Scotland and England. He resisted attempts to appoint him to judicial office under the Protectorate, although he finally accepted after Cromwell’s death in 1658. This brought him royal disfavour after the Restoration, when he was fined for his actions. He died in 1679. In 1727 Alexander Brodie of Brodie was appointed Lord Lyon, King of Arms. A splendid portrait in his official robes still hangs in Brodie Castle. He was Lyon during the Jacobite rebellion of 1745 and attended on the Duke of Cumberland throughout his Scottish campaign. His son, Alexander, died in 1759, and the chiefship passed to a cousin, James Brodie of Spynie. He married Lady Margaret Duff, youngest daughter of William, first Earl of Fife, and was a talented botanist and agriculturist who made many improvements to the estate. His eldest son died in a drowning accident and the estate passed to his grandson, William Brodie, in 1824. William Brodie of Brodie was Lord Lieutenant of Nairn from 1824 to 1873. There are other distinguished branches of this family, including the Brodies of Lethen and a distinguished family of English baronets who claim descent from the chiefly line. Sir Benjamin Collins Brodie, whose family are believed to have left Banffshire to settle in England around 1740, was one of the most distinguished surgeons of his time, and was president of the Royal Society. He was surgeon to both William IV and Victoria. He was created a baronet in August 1834. Brodie of Brodie still lives at Brodie Castle, but in 1979 the present chief placed it in the care of the National Trust for Scotland.